Wearing his trademark white panche (lungi) and white shirt, Venkaiah Naidu took oath as the vice-president of India in Hindi in the name of god. President Ramnath Kovind administered the oath of office to Venkaiah Naidu. 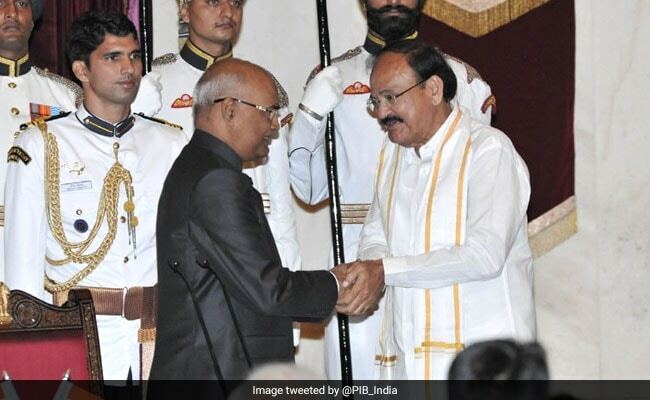 New Delhi: M Venkaiah Naidu was today sworn in as the new vice-president of India. President Ramnath Kovind administered the oath of office to Mr Naidu, 68, at a brief ceremony in the Durbar Hall of Rashtrapati Bhawan attended by political leaders cutting across party lines. Wearing his trademark white panche (lungi) and white shirt, Mr Naidu took oath in Hindi in the name of god. Prime Minister Narendra Modi, former vice-president Hamid Ansari, Lok Sabha Speaker Sumitra Mahajan, former Prime Minister Manmohan Singh, leader of the opposition in the Rajya Sabha Ghulam Nabi Azad, BJP veteran L K Advani, several union ministers, governors and chief ministers attended the ceremony. Samajwadi party leader Mulayam Singh Yadav, National Congress Party's Tariq Anwar, Communist Party of India leader D Raja, Trinamool Congress leaders Sudip Bandhopadhyay and Derek O'Brien and AIADMK's O Panneerselvam were also seen. Delhi Chief Minister Arvind Kejriwal and his Bihar counterpart Nitish Kumar -- who has joined hands with the BJP in his state -- also attended the ceremony at Rashtrapati Bhawan. Mr Naidu's wife M Usha was also present. Born in a humble agricultural family in Andhra Pradesh's Nellore district, Mr Naidu has served as BJP president, minister in various portfolios and a long-time Rajya Sabha member. This remarkable career in politics has been more than four decades in the making. It began in the 1970s when BJP's precursor Jana Sangh was a marginal player with little clout in the south and a young party worker kept himself busy putting up posters of stalwarts such as Atal Bihari Vajpayee and L K Advani. Mr Naidu has come a long way since those days of political obscurity.